When we started producing videos and writing books, there were a few good books around but most of the video had very poor production values, so we wrote our own materials. 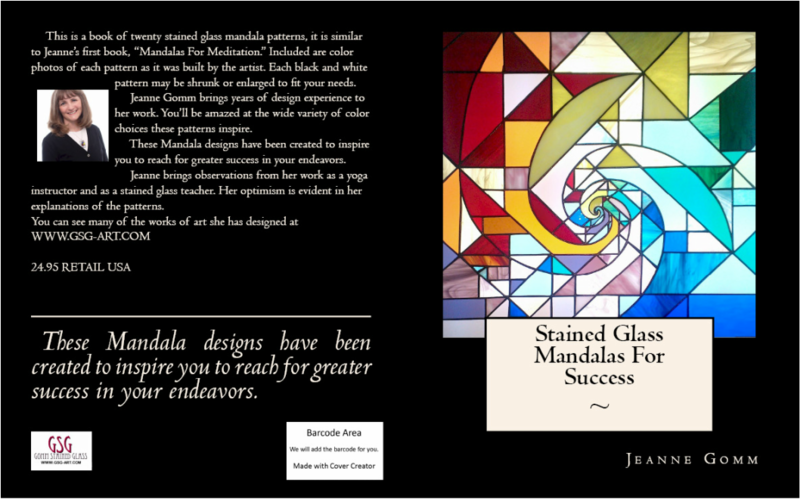 A book of twenty stained glass mandala patterns. Color photos of each of the works as they were built by the artist. Each black and white pattern may be shrunk or enlarged to fit your needs as you build these sometimes simple and yet complex designs. Jeanne Gomm brings years of design experience to her works and you'll be amazed at the wide variety of color choices these patterns will inspire. The descriptions of each of the patterns and the symbolism behind each make this a book a real treasure. Subscribe To The Pattern Sample PDF Below. ​Fill Out The Following So We Can Send It To Your email. You Have Subscribed To The Pattern Preview Check Your Email For The Link To The PDF The actual patterns come in a different format for ease of printing and taping together. To view the PDF's that go with the book, follow the directions on the back page of the book. If your book was printed early in 2014 or before, you can email us to get instructions on how to get to your patterns. I previewed the book and just have to say she's a woman after my own heart! My two loves are yoga and stained glass. Thank you for sharing. I read a little of it on the preview and fell in love with her wording and how she ties in the art and light of yoga to stained glass. What a uniquely wonderful book! I will be ordering it and can't wait to receive it. "I confess I don't know much about stained glass or mandalas, but this book is a real treasure...it's about philosophy and science...it's thoughtful and thought provoking...This book is great...it's really great. What you've done here, explaining each of the patterns and then adding pictures and then showing the pattern in black and white, it's so good...I didn't know I would enjoy ..[this book].. so much.